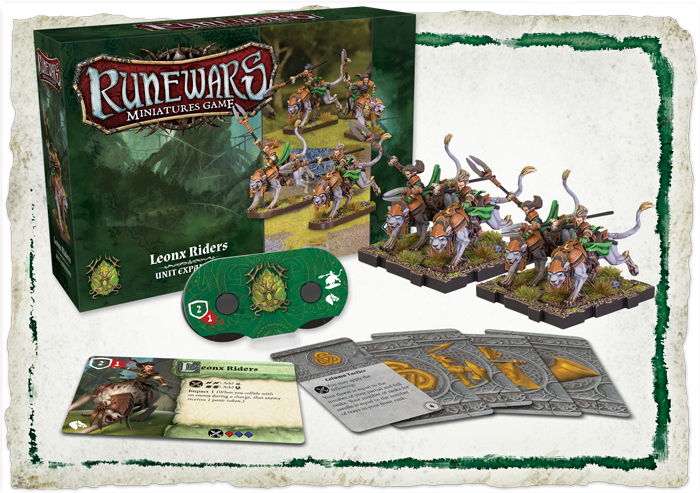 The Leonx Riders Unit Expansion for Runewars Miniatures Game comes with four Leonx Riders figures, two plastic cavalry movement trays and five upgrade cards to enhance your Latari Elves forces! This is not a standalone product. It requires a copy of the Runewars Miniatures Game Core Set and the Latari Elves Army Expansion to play. None exemplify the primal, wild nature of the Verdelam more than the Leonx Riders. Charging into battle atop the their ferocious Leonx, large felines native to the Aymhelin, these Elven warriors pierce through enemy lines with the force of a storm, only to use their lightning speed to evade counter-blows and change their angle of attack with the swiftness of a gale.